Reserve A Hidden Mountain 360 Today! Very quite location nice cabin for the most part. A couple of the stove burners were out as well as bulbs in living room and bathroom.Lampshades need replaced. But overall not to bad. Great place! We had a wonderful time and highly recommend! The cabin was very clean and comfortable, My husband and I and our 3 kids stayed we all enjoyed the hot tub. Wish it was a little more secluded but it worked just fine. Other than not being able to find the nearby creek it was a wonderful and beautiful stay! Very quiet and peaceful! We will definitely be cooking again with Cabins USA next year! Our stay and there was no WiFi in our cabin. The cabin was very nice and very comfortable. The cabin was nice and clean!! The location was great! Hot tub was clean and worked. The GPS takes you the back way to the cabin, and the gate is locked, so follow the directions that are emailed to you! The “gravel” road in the directions is now paved, we looked for a gravel road to turn onto and finally figured out it was paved! Customer service was great!!! We are definataley going back, the amenities was a plus, it was our first trip to Tennessee and it was great, reasonably priced also. We want to stay at this sane Cabin when we come back it was perfect. We had a great time. The only thing was that the loft stayed extremely hot. We had the heat set at 60 and we still had to sleep with the windows open, even on those 20degree nights. Even got a visit from Smiley which the grandkids loved and so did I. I would recommend Cabins USA for your next vacation. The cabin is in a great location however you can not follow the GPS to get to the cabin. It will put you behind a locked gate in front of the cabin. We enjoyed our stay and would definetly return. The cabin it self was very nice. However our upstairs toilet wouldn't flush, water dripped in the downstairs bathroom area, after we washed dishes we had no more hot water, the fire place didn't work and the outside hot tub didn't work. So we were a little disappointed. But staff was wonderful!! I give the staff 5 stars the cabin 3. The cabin was beautiful and our visitor, Smiley was a bonus. I read the previous reviews before coming to cabin and found that nothing was corrected. There were only two forks and two crab (very small) forks there. The fire place still did not work. We did not see a fire extinguisher anywhere in cabin and fire detectors were not working properly. We even found a fire detector in a drawer in bathroom. The cabin was clean and tidy. Beautiful surroundings and will definitely use Cabins USA for our annual trip. The check in and check out process was quick and simple, the staff members were courteous and helpful. The cabin was very nice and clean. Unfortunately the beds were very uncomfortable which made it hard to get a good nights rest. It was awkward at first driving on a shared driveway through people’s personal property. The neighbor cabin had a dog that would come onto the property and bark and growl at my children. We will definitely book with Cabins USA again, just not at A Hidden Mountain 360. Hot tub was one of the best ever. Loved the screened in porch. No internet was a bummer (oversight on my part). The location of the TV 8 feet off the floor hurt my neck. The other TV was only DVD player. Also could use some additional silverware. Need additional TV in bedroom. Fireplace did not work. No land line telephone service. Daily visits from Smiley were looked forward to, take some treats for him. No cell service on my ATT phone but hubby's Verizon phone had service. Nice cabin but needs a few updates to amenities for me. The cabin was awesome! The best part was seeing smiley every morning. He would come to back porch and say good morning everyday. The only compliant would be I called cabins USA to find out if the grill was gas or charcoal and was told it was gas (not) it was charcoal and had to drive back to town and get charcoal. I believe it was a very good deal and will definitely be staying again. Thank you Cabin USA. We loved our stay at Hidden Mountain 360. Making our reservation was easy and using express check in and out saved a lot of time. The cabin was as pictured and was neat and clean. We were welcomed by soft music and towel sculptures when we arrived which was a nice touch. Our only negative was that we found an empty beer bottle on the side porch and cigarette butts around and on the front porch which we thought should have been removed. Otherwise it was a wonderful stay! Thank you for taking the time to let us know about your recent stay in A Hidden Mountain 360! We here at Cabins USA strive to give each of our guests the best stay possible while vacationing in the Smokies. I apologize for the cleanliness issues you experienced during your stay. Your comments have been forwarded to our housekeeping supervisor to be addressed. Thank you for choosing Cabins USA and we look forward to seeing you again soon! Nice cabin for the price. Address on cabin is different from the one given on site so it's a little confusing when using Google maps. Small hole in screen door allowed a small critter to get in a pull out trash onto the deck but nothing major. Biggest problem was seeing a few roaches crawling around then finding a couple more in my bag once we got back home. This cabin worked great for me and my husband. The location is a little weird to get to, but the turn by turn direction are spot on. Didn't know this unit had a TV we didn't use it. We found the toaster did not work but no big deal. Assuming that the dog we seen every moring is the dog I have read about in the comments is a nice dog only thing was he came up to my husband in ninja dog mode with what he thought were teeth out. Luckily I had told him that I seen something about a dog here so he didn't do any thing drastic 1st. We did have a racoon get in the trash. I had also picked this cabin as it talked about a creek it wasn't much to talk about, or I was spoiled at the larger cabin we were at at the beginning of the week with the stream. Over all I don't know if I would pick this unit again, but if it was my only choice for my next trip I wouldn't look for another company to book with I would come back here. This was such a great cabin to spend a few days in! I loved the location. The drive to the cabin was a little scary at first up the gravel road but it wasn't bad at all once we got used to it. There was a horse that greeted us most times that we left and returned to the cabin! That may have been the best part! I am so happy to hear that you enjoyed your stay in A Hidden Mountain 360! We here at Cabins USA work hard to make sure each of our guests have the best stay possible while vacationing in the Smokies. When you are ready to stay with us again, please mention you are a return guest for an additional discount. Thank you again for your review and thank you for choosing Cabins USA! The location and the cabin were nice. We had a total of 5 people staying with the us and didn't have enough silverware to eat a meal, we had only 3 forks. Not that big of a deal but wanted to mention it so you are able to get more forks. We had an issue with the hot tub and called and the maintenance person responded quickly. Thank you for taking the time to let us know about your recent stay in A Hidden Mountain 360. We here at Cabins USA work hard to make sure each of our guests have the best stay possible when visiting the Smokies. Thank you for letting us know about the lack of forks in the cabin. Your comments have been forwarded to our housekeeping supervisor to be addressed. When you are ready to stay with us again, please mention you are a return guest for an additional discount. Thank you again for your review and thank you for choosing Cabins USA! We really enjoyed our stay in this cabin. Did not start off well, however because the address given via email had the house number transposed and we spent a bit of time lost on the mountain then called your associate. Associate was very helpful. We slept well, towels, etc was,plentiful and having the washer dryer was very helpful. A couple of suggestions, however for kitchen equipment. There were only three small spoons. The can opener could be replaced and the cabin was a little dusty, especially around the wood framing and the air intake vent. Also a suggestion, would be helpful to have door hooks in the bathroom so towels could be hung to dry. Again, I would certainly use Cabins USA in the future just a inexpensive upgrades would be very helpful for future tenants. Making the cabin a little more cozy would make this cabin not only a nice place to stay but a great place to stay. Thanks for the opportunity to give feedback. Thank you for taking the time to let us know about your recent stay in A Hidden Mountain 360! We here at Cabins USA work hard to make sure each of our guests have the same great stay you enjoyed while vacationing in the Smokies. Thank you for all of your suggestions regarding the kitchen equipment. Those have been forwarded to our Owner Liaisons to be addressed. When you are ready to stay with us again, please mention you are a return guest for an additional discount. Thank you again for your review and thank you for choosing Cabins USA! I really enjoyed my stay. The Sofa was very uncomfortable, TV was to high, and the gas fireplace would not stay on. But other then that it was great. Cabin was very clean the location was nice and Smiley is a good dog. The only problem I had with our stay is the upstairs shower did not work and the upstairs DVD player ought to be mentioned in description I would have taken some movies for the kids but I would not and will hesitate to rent this cabin again. Thank you for taking the time to let us know about your recent stay in A Hidden Mountain 360! We here at Cabins USA work hard to make sure each of our guests have the best stay possible while vacationing in the Smokies. I apologize for the issues you experienced with the shower and lack of DVD player. Your comments have been forwarded to our maintenance department to be addressed. When you are ready to stay with us again, please mention you are a return guest for an additional discount. Thank you again for your review and thank you for choosing Cabins USA! Awesome place to stay, close to town but far away to be back in the woods, would for sure stay there again!!!! Very roomy and nice! We loved our stay! All staff was nice and very helpful during our stay! Thank you for all of your kind words! We here at Cabins USA work hard to make sure each of our guests have the same great stay you enjoyed while vacationing in the Smokies. When you are ready stay with us again, please mention you are a return guest for an additional discount. Thank you again for your review and thank you for choosing Cabins USA! Our coffe maker went out. I called the office and they had a new one to us in 20 minutes. Thank you for taking the time to let us know about your recent stay in A Hidden Mountain 360! We here at Cabins USA work hard to make sure each of our guests have the same great stay you enjoyed while vacationing in the Smokies. I am so happy to hear that maintenance was able to get a coffee maker out to your cabin so quickly. When you are ready to stay with us again, please mention you are a return guest for an additional discount. Thank you for choosing Cabins USA and we look forward to having you as our guests again! The cabin was great, and the location was great as well. Secluded, but still only a few minutes to get back into town. The staff was very helpful, and took care of anything we needed. Definitely will be booking with you guys again. Cabin was very quiet and peaceful. A nice cabin overall, but does need some updating. Enjoyed our stay very much! Reservations, check in and check out were very easy. Thank you for taking the time to let us know about your recent stay in A Hidden Mountain 360. We here at Cabins USA work hard to make sure each of our guests have the best stay possible while vacationing in the Smokies. Thank you for letting us know about the updating needed in the cabin. This has been forwarded to our Owner Liaisons and they will be bringing this to the owner's attention. Thank you for choosing Cabins USA and we look forward to having you as our guest again! we had a great time in this cabin. It was a quit place to stay everything was clean when we got there. If I had a any complaint at all it would be there is no internet which to us was not a big deal.The neighbors did have a big dog that came and visited us every day. He was a sweet dog we called him smiley because it looked like he was smiling at you everytime he came by. Overall this was a good cabin and we will use cabins usa again. I am so happy to hear that you enjoyed your stay in A Hidden Mountain 360! We here at Cabins USA work hard to make sure that each of our guests have the same great stay you enjoyed while vacationing in the Smokies. When you are ready to stay with us again, please mention you are a return guest for an additional discount. Thank you again for your review and thank you for choosing Cabins USA! The fireplace didn't work when we got to the cabin. We called maintenance came out turned it on but no heat came out of the vents. The firepit outside was full of trash & the picnic table had missing & broken boards. Not usable at all. Would not stay at this cabin again. He didn't do anything but that. My over all stay was awesome. The worst part was trying to find the cabin and the cabin numbers didn't match made it very difficult to locate cabin causing us 4 hours of unnecessary riding. As far as staff after trying to let them know of the problem the person Donnie I spoke with was extremely rude with no understanding or compassion. Later April Gann called about my concerns and she really made a difference in how I felt later. So I really appreciated her calling with her concerns. Nice cabin, great price and good location for hiking, site seeing, shopping and getting away. We would recommend Cabin USA, Hidden Mountain 360 and we would stay there again. Thank you so much for all or your kind words! We here at Cabins USA work hard to make sure that each of our guests have the same great stay you experienced while vacationing in the Smokies. When you are ready to stay with us again, please let our reservationists know you are a return guest for an additional discount. Thank you again for your review and thank you for choosing Cabins USA! We had a very clean cabin. Our beds were comfortable and the hot tub was awesome. We will definitely use Cabins USA again. I am so happy to hear that you enjoyed your stay in A Hidden Mountain 360. Our housekeepers work hard to make sure that each of our cabins are thoroughly cleaned and fully stocked so all you have to do is walk into your cabin and start relaxing. When you are ready to stay with us again, please let our reservationists know you are a return guest for an additional discount. Thank you for choosing Cabins USA and we look forward to having you as our guest again! Cabin was exactly what i thought it would be and more. Very clean and comfy..enjoyed the satellite tv at night....would recommend to anyone and everyone! Thank you for all of your kind words! Our cleaners work hard to make sure that each of our cabins are thoroughly cleaned and fully stocked so our guests have to do is walk into their cabin and start relaxing. When you are ready to stay with us again, please let our reservationists know you are a return guest for an additional discount. Thank you again for your review and we look forward to having you as our guest again! My stay was great. I have been using cabinsusa for some time now and have always had a pleasurable experience. Thank you for all of your kind words and thank you for always choosing Cabins USA when visiting the Smokies! We work hard to make sure that each of our guests have the same great experience you enjoy while vacationing. Thank you again for choosing Cabins USA and we look forward to seeing you again soon! We stayed for two nights. We loved the cabin. Everything was well prepared for our visit. Check in was easy and the cabin was fairly secluded. We had one neighbor next door but they were far enough away that the cabin felt like a hideout in the woods. The only problem that we had was that the chain on the rubber flapper in the upstairs toilet wasn't connected, so we had to reach down into the clean water in the tank to lift the rubber stopper to flush the upstairs toilet. That wasn't a big deal, though, and we left them a note about it when we left. I imagine that is not the kind of thing you would notice while cleaning up the cabin for the next guest. Overall, we had a great visit and the cabin was as we expected. Thanks! I am so happy to hear that you enjoyed your stay in A Hidden Mountain 360! Thank you for letting us know about the issue with the toilet. That has been sent to our maintenance department and they are correcting that issue. Thank you for choosing Cabins USA and we look forward to having you as our guest again! This was the first time experience of renting a cabin and I have to say this was a very easy process the express check in was very convient and so easy and check out was even easier. The house was wonderful very clean, even though we didn't spend a whole lot of time at the cabin it was very nice to come back to a home feeling. 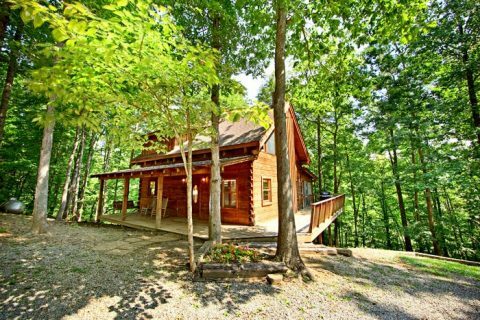 I would recommend this cabin to anyone that's just looking to get away and be somewhere quiet very peaceful surroundings. They had it very well stocked for everything that we would have needed if we spent the entire vacation at the house. Most places don't stock as much as they did. And the big plus was the washer and dryer. Overall the stay was a 10 we will sure be back next year to the area. Thank you so much for all of your kind words and I am happy to hear that you enjoyed your stay in A Hidden Mountain 360! We here at Cabins USA work hard to make sure that each of our guests have the same great stay that you enjoyed. When you are ready to stay with us again, please make sure that you let our reservationists know that you are a return guest for an additional discount. Thank you again for your review and we look forward to having you as our guest again! This was our third time renting a cabin in Smoky Mountains, but our first time with USA Cabins. We chose this cabin for the location and that worked out great. Once you learn the back roads you don't have to deal with the crowds of people or traffic. The cabin itself is older and has some issues with critters on the outside. The inside of the cabin was what we figured it would be and that was fine. I do believe there is some sort of mold issue on the ceiling and the blinds need replaced. The carpet could also use some help in places. Our biggest prob. was that the cabin was dirty in places when we got there, we called USA Cabins and they did make this situation right. There is no broom at this cabin and most people would be fine with this, but we have young children who don't always like to put shoes on and I had no way to clean up all the wood on the deck and the porch from the woodpeckers and Carpenter Bees. The last thing would be to bring any games you may want to play and a ball if you want to play the foosball game. We will use USA Cabins again and stay in the same area, but in a different cabin. Excellent stay! Just a couple miles out of Pigeon Forge. We felt really at home with our own kitchen and hot tub! The only thing was that the beds were hard as rocks! So if you have a bad back, bring some extra support! Other than that, we wanted to stay forever! Thank you for your review. We are delighted that you enjoyed your stay with us. We appreciate your feedback, and we hope that we will hear back from you again soon. Do not forget to call us about your return guest discount. The only REAL complaint I have is the BED. OMG, the mattress was terrible. Please let the owners know they need to invest in new mattresses. The rest of the place was great. Also, for privacy reasons they may want to either get a new front door that does not have a full glass view (some folks like to run around naked) or simply hang up a curtain over that full glass door ! LOL! Amazing cabin. Even though the neibors dog came to visit us, it was still awesome. The hot tub was a little strong on the chemicle smell, but other than them 2 little problems it was great. Absolutely loved it and plan on coming back. Cabins USA is probably the only cabin facilitie I'll work with. For my very first experience even staying at a cabin, it was all around fantastic. I can't wait till I go back. The cabin was very clean and a great value. Enjoyed the fairly private area as hoped for. A nice surprise was that the cabin is equipped with a washer and dryer (apartment style) which was not mentioned on the website. We definitely enjoyed our stay and would love to return! We loved the cabin! It was in a good location for our needs. The cabin is dated but it still fit our needs for the week. There is only one couch and chair with a small TV. The top bedroom is open with not much privacy. It is a nice cabin for 2 people or a small family. We enjoyed the front pouch swing and rockers. I would stay here again but my husband wants one with a view next time! The hot tub is on a screened- in deck. We spent a lot of time there. Everyone was very helpful with getting us booked and directions to the cabin were right on target! Thanks for making our vacation time nice. Cabin was nice. Opening in southwest corner of livingroom letting wasps in......holes in screens on porch..... gate by cabin locked forcing you to go through someones yard to get to cabin. Small things I know we will be back next trip! Thank you for your review. We appreciate all your feedback. We have updated the directions to A Hidden Mountain 360. We hope that you will choose Cabins USA for your next Smoky Mountain vacation. When we arrived at the cabin, my husband (who had not seen any pictures of the cabin) was in amazement! We both enjoyed the outside porch the most I think! We just needed to relax and relaxation is what we got!!!! The cabin was nice and close to most local activities. The location of the cabin was great, private. It smelt a little musty, like its been closed up or something. The beds were OK could of been softer. We love the Hot tub and the screened in back porch. This cabin just need a little up date, TLC and lesser price until up date. Loved our time here. The water pressure was awful. We had a great time and will book with you again. The carpet was pretty dirty though...everything else is great! The mattresses on both queen beds need to be replaced. The queen bed in the master bedroom downstairs was not level--it was lower on one side. They could also use new bedspreads. The foosball table didn't have a ball to play a game. Overall, it was a great cabin, but could definitely use some updating. we do love this cabin but it has lost something through the years for us . the hot tub was the main thing that we loved and now it is not the same it does not have the jets and bubbles and the beds the matresses are so hard that we have to buy foam to put on them cause our backs hurt so so bad after sleeping on them ,they really need to up date the matresses . but the cabin is gorgeous and we love the fireplace and the location . Nice cabin, but you have to drive thru 3 privet yards, and very steep grade dirt road to get to it, when the paved road is right at a locked gate at the frunt door. Thank you for taking the time to review your stay in A Hidden Mountain 360. We hope that you will stay with Cabins USA for your next Pigeon Forge vacation.